The Children’s Division is part of the non-formal program at the Oakley Ballet Center, which includes Pre-Ballet and Level C1 emphasizing creative movement, expression, and a strong foundation in classical ballet technique. No audition is required, only a placement class. Minimum level attendance is one class per week. Children’s Division Level 1 (C1) is only offered one class per week. Formal Division Level 1 (F1) is required to take two classes per week. Ages are approximate and placement in all levels is at the discretion of the school director and staff. Audition and a placement class are required for all students to attend at this level. Beginning Level (1 – 2) emphasizes a strong foundation in classical ballet technique. More classes will be offered in these levels, and children who enjoy ballet and show more interest and dedication will be recommended for this program. Intermediate and Advanced levels are part of the Professional Training Division Training Program. Participation in Footworks Youth Ballet’s (FYB) performances is recommended as an opportunity to craft artistry and apply technique. FYB is the non-profit affiliate of Oakley Ballet Center that sponsors countywide performances throughout the year. Intermediate Level (3, 4, 5) is designed to develop discipline and self-motivation in a positive classroom atmosphere. Continuation of proper technique, dance quality, and vocabulary expansion are stressed. Pointe is offered at this level with the recommendation of the school director. Advanced Level (6 – 7) is designed for serious students with a strong commitment to ballet training who wish to improve their artistry and ballet technique. 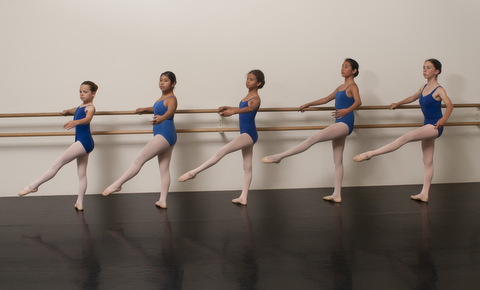 Total training may include technique, pointe, body conditioning, repertoire, jazz, modern, character, as well as performing in Footworks Youth Ballet’s productions as a corps de ballet member, soloist or principal dancer.